There are many styles of roofing tiles for homes. Many times these styles are called flat profile roofingtiles, low profile roofingtiles and high profile roofingtiles. Some are known as Mission Roofingtiles, Villa Roofingtiles, Slate Roofingtiles, Shake Roofingtiles, Roman Roofingtiles, Double Roman Roofingtiles, Estate S-Tile, Espania Roofingtiles, Flat Roofingtiles or Barrel Roofingtiles. Aluminum Roofing Tile Molds are the molds that Roofingtile Companies use to make the concrete tiles for roofs on homes. They produce several thousand roofing tiles a day using an extrusion process with a concrete slurry. Aluminum Roofing Tile Molds for Concrete Roofing Tile Industry also called Roofing Tilemolds, Tile Molds or Roofingtile Plates are usually made in aluminum or steel. Aluminum roofing tile molds weigh less and usually cost less than steel. Concrete roofing tile machines make 1,000's of roofing tiles a day using these aluminum roofingtile molds. They produce roofing tiles using an extrusion process with a concrete slurry that dries in kilns to produce a durable concrete roofing tile. Most concrete roofingtiles will last on a home over 50 years. Homes with concrete roofing tiles are also more fire resistant. 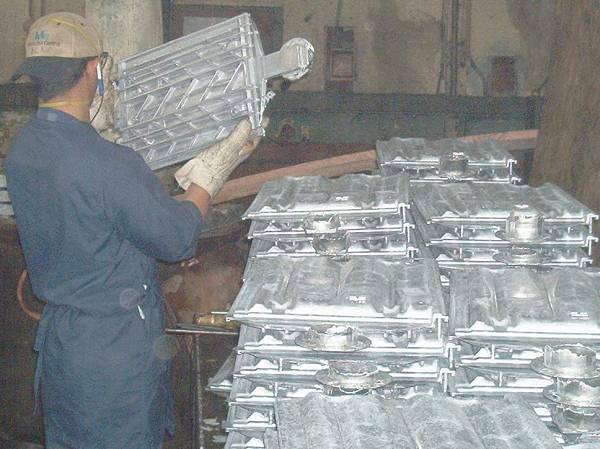 Tile Mold production of 500-600 aluminum diecasting parts each day. Free Samples of new tooling products. Design assistance or Metal Prototype Parts of Tile Mold styles. Aluminum die cast tilemolds weigh 1/3 that of a steel part. Coating operations to prevent concrete sticking. We make Tooling for Die Casting Molds to produce the tile molds.